So last night, Paul turned in for sleep after clicking off the TV (and a disappointing football game; the Packers are no longer undefeated.Â Stinkin’ Chicago Bears!). I took out the trash and attended to other things around the house for a few minutes before finally checking on Emma and then heading for bed, myself. And that’s what happens in Wisconsin when the Packers give up the ball four times in the second half, ending up losing what initially appeared a promising game. Poor, native Wisconsinites dream and even sleep-talk about it. I tried another recipe out of the “Beyond Macaroni and Cheese” cookbook this weekend.Â It’s pretty good! 2. Cook pasta; drain.Â Return to pan; stirÂ butter into pasta until melted. 3.Â Stir egg and parmesan cheese into pasta. 6.Â Stir in tomato sauce and oregano; heat through. 7. 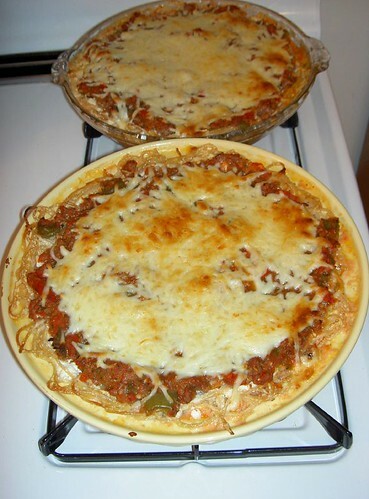 Spread cottage cheese on bottom and up side of spaghetti “crust” .Â Spread meat mixture over cottage cheese; sprinkle mozzarella cheese over meat mixture.Â Bake uncovered 20 – 25 minutesÂ . Let stand 5 minutes Â and cut into wedges to serve. Serves 6. We parents of a 13-month old sometimes feel that we don’t get out too often, other than for work, school, etc. But we had a date night over the weekend, while Emma stayed at home in the care of my mom. Dinner at Crawdaddy’s in West Allis was fabulous.¬ Crawdaddy’s boasts a New Orleans-style menu and was ranked best local restaurant for seafood by some local reviewers.¬¬It was our first time eating there, but we’ll be back in the future. And then it was off to the movie theater. None of the choices were particularly appealing, but we figured that a film with Nicholas Cage in it couldn’t be all bad.¬ We chose The Wicker Man. I could take the time to expound on why this one left he wondering what I had just seen,¬but that has already been done so eloquently at this link. 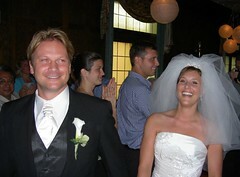 PaulÄôs brother, Mark, finally abandoned his bachelor ways at, at the age of 33, has settled down with a wonderful woman, Fran. 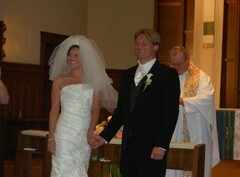 We attended their elegant and lovely wedding in quintessentially middle-America Fond du Lac, Wisconsin over the weekend. We couldnÄôt be happier for the newest Koog Family. Posted in Greetings, Weekend Stuff | Comments Off on New Sister-In-Law!! I attended a bridal shower this morning. 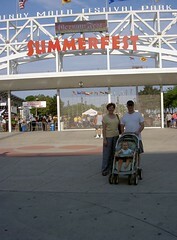 Then Oma, Paul, Emma and I visited German Fest at the Summer Fest Grounds. 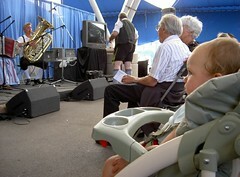 It was a scorcher of a day, but we enjoyed the sights and sounds at AmericaÄôs largest annual German Festival. We listened to a musical groups large and small, wandered around the cultural tent and some souvinier pavillions. We heard people speaking German. We ate bratwursts and strudels and drank beer. Oh yes and Cheerios. Emma ate Cheerios. Yep, an authentic German experience all the way around! 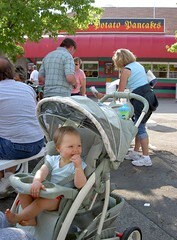 After spending the night at Emma’s Grandma and Grandpa K’s house last evening, we attended my annual work picnic today. This year it was held at the Zoo. To Emma’s (and my) delight, we rode the train! ¬I neglected the blog, but my closet looks good. ¬I sorted and laundered like I knew that I could. ¬IÄôd ignored closet crowding since EmmaÄôs been here. ¬But with renewed strength and vigor, allÄôs now ordered and clear. ¬I also turned my attention to packing. ¬Seven cushÄô days at sea is a challenge worth tackling. ¬For the Yukon and AK we should bring some warm clothes. ¬Paul and Emma had to leave due to her little cries. ¬They sat in the back and missed all the action. ¬But cheerios provided her some satisfaction. ¬Sunday night was an exciting one on our street. ¬There was thunder, and rain, and mixed in with that, sleet. ¬Then the rain came down harder.¬ The street started to flood. ¬and every few seconds, let out a glad holler. ¬Emma, for her part, was¬intrigued by the¬rain. ¬She stood up to¬bang on the¬window pane. ¬Candles and a flashlight guided the rest of the eveÄô. ¬In the morning we discovered the outage reprieve. 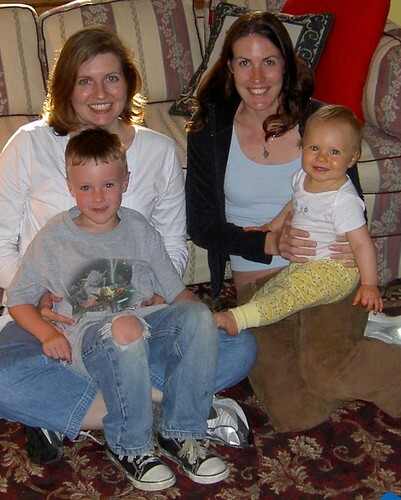 Sisters and Cousins, originally uploaded by Koog Family. We had a very special visit from Emma’s Auntie Pam, Cousin Alex, and Grandpa S.
Collectively, we¬jumped on a trampoline, visited my office, went to a pig roast, rode in a paddle boat, had¬a cookout, went to the zoo, exchanged presents, played with toys, cried,¬ate custard, laughed, went to a restaurant, watched cartoons, blew bubbles, and tried to catch nightcrawlers. I arrived at work on Friday morning and checked my calendar.¬ It was then that I saw that we had opera tickets.¬ For the next night.¬ I’d forgotten. I just wasn’t up for it.¬ A quick call confirmed that¬Paul wasn’t up for it, either. In fact, we’d been thinking of getting a sitter and checking out The DaVinci Code. (I had read the book, and wanted to see it – bad reviews and all). And that’s what we did.¬ I found takers for each of¬our two opera tickets.¬ One went to someone who had been trying to¬find an unused ticket¬anyway, and who has been listening to his new Aida CD since Christmas.¬ Perfect.